On the Top 10 list of things you never want your kids to try, smoking a cigarette is right up there. If your kids are older, chances are you’ve already had a conversation with them about the dangers of smoking. No matter what their age when you first talk about it, it’s a good idea to revisit the subject as they navigate their high school years. While you’re at it, don’t forget to talk about e-cigarettes too. These relatively new devices are becoming more and more popular, especially with people trying to reduce or eliminate their cigarette smoking habit. But new data shows that many young people are trying e-cigarettes even if they’ve never smoked regular cigarettes. And that can be the first step on a slippery slope towards forming a habit. E-cigarettes are harmless, right? Wrong. If you’ve never used an e-cigarette, you probably haven’t given much thought to how they work or what’s in them. E-cigarettes are battery-operated devices with a heating element and a cartridge which holds liquid; the liquid can contain nicotine, flavourings and certain chemicals. When the user puffs on the device, the heating element is activated and the liquid is vaporized—thus the term ‘vaping’. 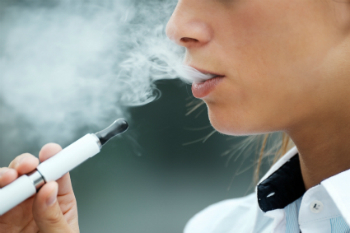 Some types of e-cigarettes are disposable; some have rechargeable batteries and refillable cartridges. It’s important to know that even though e-cigarettes don’t burn—and therefore don’t produce smoke—the liquids often contain nicotine. The other commonly used ingredients in the liquids, such as propylene glycol (PG), are approved for human consumption, but since e-cigarettes are still relatively new, there is no significant long-term data yet on the effects of inhaling the ingredients found in e-liquids. There’s a push for more and better regulation of the e-cigarette industry in Canada. Currently, e-cigarette devices and liquids are not officially approved for manufacture or sale but due to a lack of legislation in the category, they are readily available in “vape shops”, convenience stores and online. Manufacturers can produce and sell e-liquids without submitting the products for testing, a fact which means you won’t always know what’s in them. Many e-cigarette advertising campaigns tout the advantages of ‘vaping’ in public places where regular cigarette smoking is not allowed. Who would have imagined that the schoolyard would be one of those places? Studies published by the National Institutes of Health in the US, and the Institut national de santé publique du Québec, indicate that children as young as 11 years old have tried e-cigarettes. In Quebec, an estimated 5,000 grade 6 children have tried e-cigarettes and 142,000 secondary V students have tried them. The US data shows that even though regular smoking has decreased among school-aged children, the use of e-cigarettes has risen by 4 to 7 percent. There is a bit of good news in all this: the provincial government has started to address the sale and use of e-cigarette products through legislation that will ban sales and promotion to minors, and ban e-cigarette use in schoolyards and other places where cigarette smoking is not allowed. In the meantime, make sure your kids know why you’ve just added ‘vaping’ to the Top 10 list.